Cutting tree and splitting wood are what people do by themselves to save cost. Some enjoy doing them and consider these as their hobby. No matter which category you fall into, you would surely need the best log splitter. Well, there are a lot of things that you need to consider when choosing a log splitter. It takes time before you can finally find the one that meets all of your needs and preferences. Take our guide below for everything that you need to know about buying this appliance. Many people think that all of the wood cutting devices are the same. They help you to cut woods. However, some of them do the better job than others. In case you are searching for a tool for this specific task, a log splitter is worth considering. It is easy to move. A log splitter includes rubber wheels so that you can easily move the unit around when you split words in different places. It takes less time to cut woods, especially when you have to deal with a big pile of logs. You don’t have to spend a lot of energy. The machine can do the job all by itself. Also, log splitter makes wood cutting a safer job, specially axe. Using axe increases the risk of getting injured against your muscles and joints. There are three main types of log splitter including electric, gas and manual types. There is no smoke emission as well as large noise. It can cut woods into pieces precisely within the shortest amount of time among all types of log splitters. Some models of electric log splitters have a cycle time of around 8 to 10 seconds only. (While other types such as gas splitters take more than 10 seconds on average). Maintaining the motors is easy. You don’t need to clean the gas tank like what you have to do with a gas log splitter. You can’t use this appliance if there is no power supply around. Who should use it? This type of log splitter is suitable for anyone whose job has to deal with a great amount of wood in a short amount of time. You can work with this type of splitter anywhere- both indoors and outdoors. It offers a significant splitting capacity and power. The electric splitters produce forces ranging from 2 to 25 tons for cutting logs of 20 inches in length. On the other hand, a gas splitter can work up to 30 to 40 tons. And it can cut logs of more than 40 inches depending on the models. While a gas log splitter is bulky, there is a trailer to assist you to move the unit around. It is more difficult to use in comparison with using an electric log splitter as one unit is bulkier and have more parts to assemble and work with. You also have to refill the gas frequently, even in the middle of your work. Moreover, this log splitter produces gas fumes. Who should use it? Provided that you have to cut a lot of wood logs in a small amount of time, this log is for you. It is also suitable for anyone who works on ground with no or little access to a source of electricity. It is lightweight, easy to use and affordable. A unit typical weighs around 100 pounds. You can bring it around and work with the splitter anywhere you desire. It doesn’t need electricity and gas to perform, all you need is your power. It takes you more time and energy to cut down a huge pile of logs as you have to split logs manually. Who should use it? If you are a homeowner who would like to cut small to medium wood log now and then, this splitter is worth considering. The sizes of the logs you normally have to deal with. If the logs are small in diameter, you would need a splitter with a lower tonnage. For example, for small logs of up to 12 inches in diameter, you can go for a wood splitter of fewer than 20 tonnages. On the other hand, if you have to cut wide tree trunks (one with more than 18 inches in diameter), consider splitter of more than 20 tonnages. How old the woods are. If they are fresh and have just been cut down, you would need a stronger splitter. However, when these wood logs become more seasoned (these woods has been cut down more for than six months), it is much easier to cut, even with a weaker splitter. The motor is another indicator of a log splitter. A 2HP motor is sufficient for your household chores. However, a 3 HP motor is more powerful and more suitable for commercial use. The capacity of the wood splitter indicates how big and long a wood log the splitter can handle. It is worth noting that among three types of splitters, the gas type is the one which can handle the biggest and longest logs. Different types of wood splitters have different capacities. Based on your need and the type of wood you encounter, you can choose the capacity of a log splitter accordingly. For example, if you often have to cut woods of around 10 inches in wide and 20 inches in length, go for an electric wood splitter. Alternatively, when you split woods of more than 30 inches in length, the only gas wood splitter can help you handle these logs. The shorter the cycle time, the quicker the machine helps you to split logs. If you have to deal with a huge amount of wood, choosing one with shorter cycle time would be better. On average, an electric wood splitter has the shortest cycle time. The shortest time on record is 2 seconds. Overall, you can expect the cycle time around 6 to 9 seconds with an electric type. For a gas wood splitter, a cycle time would take more than 10 seconds. Nevertheless, the specification ranges widely in different models as well. Make sure you read the specification list of a wood splitter or ask the experts in the supply store for more information. Most of the high-quality wood splitters on the market would provide a 2-year limited warranty or more. You should only buy a splitter with a warranty. Some of the manufacturers also offer free lifetime technical support, which is worth considering as well. If you want to use your log splitter for a long time, go for steel construction as it is the most durable. The higher the grade of steel, the longer the unit can last. Adjustable Height. A wood splitter with a suitable height will reduce your risk of getting back injuries. In case you want a log splitter that can be moved around easily, you should choose one with a ball hitch. Here is the list of the best wood splitters of different powers, tonnages, and capacities. Cycle Time: 12 seconds down and back. Capacity: Logs of up to 23.8 inches in length and 100 lbs. The Most Outstanding Features: Dual Log Catchers and handles logs. They help you to load the logs into the tool easier. They also prevent and reduce your risks of getting injuries when loading and unloading wood logs. Verdict: With its power and efficiency, this wood splitter is suitable for both home use and commercial use. It is also suitable to use when you have long and large pieces of woods. It could be operated horizontally and vertically so that you can easily switch between positions when handling with big wood logs. This log splitter is towable with 2-inch ball coupler allowing you to move this unit around without much effort. It is one of the most powerful wood splitters on the market which can cut the hardest wood in the shortest time possible. You can turn on this machine quickly even when the temperature drops down thanks to the five horsepower engine and two pull handling system. You have to deal with problems that you normally encounter with other gas log splitters such as gas fumes. It would take time and effort for you to assemble the unit. Tonnage: 22- As you can see, both of the electric log splitters on the list have high tonnages. Capacity: Logs of up to 20 inches in length and 100 lbs. Its Most Outstanding Features: 5 Gallon Poly Hydraulic Tank and removable log cradle for a compact design and light weight. Verdict: This wood splitter is suitable for homeowners to cut small pieces of woods. Also if you tend to deal with a wide variety of woods- ranging from green to well-seasoned wood, this wood splitter is for you. Just like the Champion product above, this wood splitter could be operated horizontally and vertically. Hence, you can easily switch between positions when handling with big wood logs. It works well on a wide variety of wood including oak, ash, walnut, and elm. It works well in toughest wood as well, both green and seasoned types of wood. This log splitter can be turned on quickly regardless of the condition of the weather. Also, this model is quite compact and lightweight. The material which is used to make this appliance is high-grade It means that you can use this for a long time. It always requires a source of power before you can use the log splitter. There is no battery included for electric start. Tonnage: 22 tonnages, which is as much as other two electric wood splitters I review above. Capacity: This wood splitter can split logs of up to 18 inches in diameter and 25 inches in length. It Most Outstanding Features: A hydraulic cylinder with the smart design for you to refill the gas to operate the wood splitter. Verdict: This wood splitter is suitable for both homeowners and commercial uses. It can be used to cut big chunks of woods. If you have to deal with large and well-seasoned pieces of woods, this is worth considering. You can easily carry this log splitter around with its towable frame and 2-inch ball hitches. It is worth mentioning that the tires of this unit are made of hard wearing 6-inch rubber which is very durable and easy for you to maneuver around. When you turn on this log splitter and run it, it causes very little noise. Therefore, it would not affect your attention as well as anyone around you. This wood splitter is made of heavy duty steel for extra durability. It would not handle long and well-seasoned pieces of wood as effectively as other types of gas splitters. In comparison with other gas powered log splitter, this machine requires more maintenance. Cycle Time: 2 seconds- this is the shortest amount of time on the list. Capacity: It would be able to handle the logs of 20 inches in length and 16 inches in log diameter. It Most Outstanding Features: Built-in log cradle for you to easily carry the unit around. Verdict: If you work with not so many pieces of wood logs and these wood logs are small, you can consider this option. This wood splitter is very lightweight, allowing you to carry this unit around. It has the shortest cycle time so that you can cut down a pile of logs in a short amount of time. With the additional feature of a build in log cradle, it is very safe and easy to handle and operate this log splitter. Also, this appliance is small and compact so that you don’t have to find a lot of space to store this unit. You don’t need to spend a lot of time to assemble this wood splitter. This has a weaker HP motor and tonnages so that it could handle short and thin logs. It is more suitable for household use rather than commercial use. The warranty time is rather short. The head of this axe is made of steel weighing 4.18 lbs. The total weight of the axe is 5.5 inches, and the length of it is 35.5 inches. The sheath of this axe is made of top grain leather, and the handle is made of wood. Verdict: If you prefer portable and easier to carry around wood splitter, consider this splitting axe. You can handle all types of woods with this axe. It is available to use all of the time. You don’t need to find a source of power of gasoline to operate this wood splitting tool. Also, with the innovative design, you can exert less energy but still manage to splitter effectively and efficiently. 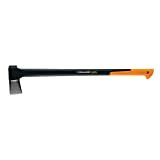 The construction of the axe is made of high quality and durable solid steel to handle heavy duty job and. On the other hand, the top grain leather sheath is very convenient for you to handle it with comfort. It is very safe to use this axe as it comes with a lot of safety features. For example, on the back of the axe, you can find a break, allowing the tool to stop on the surface of the wood instead of cutting into the ground or your legs. The blade is small enough for you to cut deep into the wood with great force. However, it would not be powerful enough to cut big chunks of woods. It is more expensive than other wood splitting axes on the market. Improper ways of handling log splitter could lead to severe injuries and tragic accidents. Here are some of the things that you should remember to stay safe when using your log splitter. Know where you should stand. Each of a log splitter has an “operator zone” in which you need to stand to be safe. Make sure you know about the specifications of your log splitter and its limits. Your log splitter can handle logs at certain lengths and diameter. It is advisable that you read the manual of the product carefully. The book contains things you need to know to operate the splitter properly and safely. Besides knowing well about your log splitter, you would also know well about the type of wood you are working with. For example, if the piece of wood you are working with is crotched, make sure you prepare for it to split irregularly. Always use two hands to operate your log splitter. Wear a pair of goggles to prevent splinters from being shot onto your eyes. Other protective personal equipment you should wear while handling your log splitter includes safety gloves and ear protection. Finally, always wear a pair of steel-toed boots so that your toes are protected in case a log falls off. Never wear loose fitting clothes. Take off all of your jewelry before working. Be aware of your surroundings. Make sure you work in an open and well-ventilated area with no people within the proximity of the wood splitter. Only work when you are fully alerted. Stop using the log splitter immediately if you feel tired or your hands become weaker. Cutting wood logs into smaller pieces would be a challenge or a boring chore if you don’t have the right tool. With the best log splitter, you would be able to make this task an enjoyable thing to do. I hope with the information above; you would know what to look for in a wood splitter and how to operate it safely. Also with the review of the best splitter, I am sure that you can quickly find the one that meets all of your needs and requirement. It would take time and effort for you to buy the right one but I am sure you would get there. In the end, you will enjoy working with your wood splitter just like I do.